General of Infantry, His Imperial and Royal Apostolic Majesty's Privy Councillor, Maximilian Csicserics von Bacsany. The Royal Bulgarian First Legation Secretary, Dr Theodor Anastassof. His Excellency, Zeki Pasha, General of Cavalry, Adjutant General of His Majesty the Sultan, and Military Envoy Plenipotentiary to His Majesty the German Emperor. Grigory Ivanovich Petrovsky, People's Commissar for Internal Affairs. Germany, Austria-Hungary, Bulgaria and Turkey for the one part, and Russia for the other part, declare that the state of war between them has ceased. They are resolved to live henceforth in peace and amity with one another. The contracting parties will refrain from any agitation or propaganda against the Government or the public and military institutions of the other party. In so far as this obligation devolves upon Russia, it holds good also for the territories occupied by the Powers of the Quadruple Alliance. The territories lying to the west of the line agreed upon by the contracting parties, which formerly belonged to Russia, will no longer be subject to Russian sovereignty; the line agreed upon is traced on the map submitted as an essential part of this treaty of peace (Annex 1). The exact fixation of the line will be established by a Russo-German commission. No obligation whatever toward Russia shall devolve upon the territories referred to arising from the fact that they formerly belonged to Russia. As soon as a general peace is concluded and Russian demobilization is carried out completely, Germany will evacuate the territory lying to the east of the line designated in paragraph I of Article III, in so far as Article VI does not determine otherwise. The districts of Ardahan, Kars, and Batum. will likewise and without delay be cleared of Russian troops. Russia will not interfere in the reorganization of the national and international relations of these districts, but leave it to the population of these districts to carry out this reorganization in agreement with the neighbouring States, especially with Turkey. Russia will, without delay, carry out the full demobilization of her army inclusive of those units recently organized by the present Government. Furthermore, Russia will either bring her warships into Russian ports and there detain them until the day of the conclusion of a general peace, or disarm them forthwith. Warships of the States which continue in a state of war with the Powers of the Quadruple Alliance, in so far as they are within Russian sovereignty, will be treated as Russian warships. The barred zone in the Arctic Ocean continues as such until the conclusion of a general peace. In the Baltic sea, and as far as Russian power extends within the Black sea, removal of the mines will be proceeded with at once. Merchant navigation within these maritime regions is free and will be resumed at once. Mixed commissions will be organized to formulate the more detailed regulations, especially to inform merchant ships with regard to restricted lanes. The navigation lanes are always to be kept free from floating mines. Estonia and Livonia will likewise, without delay, be cleared of Russian troops and the Russian Red Guard. The eastern boundary of Estonia runs, in general, along the river Narva. The eastern boundary of Livonia crosses, in general, lakes Peipus and Pskov, to the southwestern corner of the latter, then across Lake Luban in the direction of Livenhof on the [western] Dvina. Estonia and Livonia will be occupied by a German police force until security is ensured by proper national institutions and until public order has been established. Russia will liberate at once all arrested or deported inhabitants of Estonia and Livonia, and insures the safe return of all deported Estonians and Livonians. The fortresses built on the Aaland Islands are to be removed as soon as possible. As regards the permanent non-fortification of these islands as well as their further treatment in respect to military and technical navigation matters, a special agreement is to be concluded between Germany, Finland, Russia, and Sweden; there exists an understanding to the effect that, upon Germany's desire, still other countries bordering upon the Baltic Sea would be consulted in this matter. The prisoners of war of both parties will be released to return to their homeland. The settlement of the questions connected therewith will be effected through the special treaties provided for in Article XII. The contracting parties mutually renounce compensation for their war expenses, i.e. of the public expenditures for the conduct of the war, as well as compensation for war losses, i.e. such losses as were caused them and their nationals within the war zones by military measures, inclusive of all requisitions effected in enemy country. Diplomatic and consular relations between the contracting parties will be resumed immediately upon the ratification of the treaty of peace. As regards the reciprocal admission of consuls, separate agreements are reserved. As regards the economic relations between the Powers of the Quadruple Alliance and Russia the regulations contained in Appendices II-V are determinative, namely, Appendix II for the Russo-German, Appendix III for the Russo-Austro-Hungarian, Appendix IV for the Russo-Bulgarian, and Appendix V for the Russo-Turkish relations. The re-establishment of public and private legal relations, the exchange of war prisoners and interned civilians, the question of amnesty as well as the question anent the treatment of merchant ships which have come into the power of the opponent, will be regulated in separate treaties with Russia which form an essential part of the general treaty of peace, and, as far as possible, go into force simultaneously with the latter. In the interpretation of this treaty, the German and Russian texts are authoritative for the relations between Germany and Russia; the German, the Hungarian, and Russian texts for the relations between Austria-Hungary and Russia; the Bulgarian and Russian texts for the relations between Bulgaria and Russia; and the Turkish and Russian texts for the relations between Turkey and Russia. The present treaty of peace will be ratified. 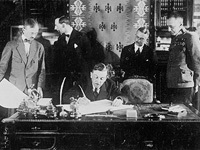 The documents of ratification shall, as soon as possible, be exchanged in Berlin. The Russian Government obligates itself, upon the desire of one of the Powers of the Quadruple Alliance, to execute the exchange of the documefits of ratification within a period of two weeks. Unless otherwise provided for in its articles, in its annexes, or in the additional treaties, the treaty of peace enters into force at the moment of its ratification. Executed in quintuplicate at Brest-Litovsk, 3 March 1918.